Adding to the already existing range of autoclavable laboratories trays, is the utility tray and as the name suggests this polypropylene tray can be utilized for purposes ranging from drying glassware to sterilizing and to store any laboratory apparatus. Riding on vast volumes of expertise in this arena, we are occupied in offering Slide Tray and Staining Stand. - Dissecting with wax, made of aluminum/ galvanized sheet size 10x12. We are manufacturing Quartz Glass Parting Tray with Fabricated thimbles & with ring with separate thimbles. We provide these parting trays on customized basis as well, as per the needs of our buyers. 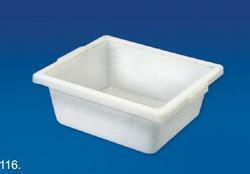 Alumina Tray available in 5ml, 10ml, 25, 80, 100, 225ml. Apart from this, other sizes also available. Price change as per the parameters and qty. 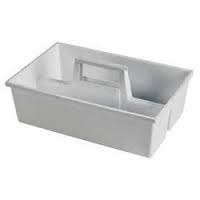 These multipurpose laboratory trays are molded in polypropylene and can be used for sterilizing, drying glassware, porcelain ware & other laboratory instruments. These steam autoclavable trays have tapered walls which prove good for nesting. - Carrier Tray has a unique feature i.e its handle which proves really helpful in carrying reagents or laboratory apparatus from one place to another, single handedly. - Size 380 x 240 x 115 mm, Pack of 6 Pcs.